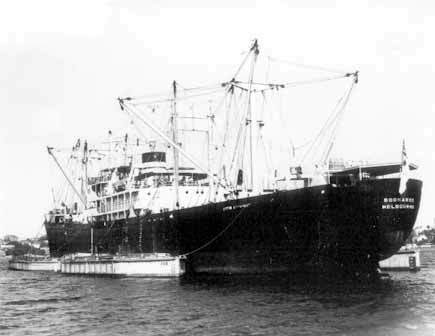 In 1966 the Australian National Line cargo vessel MV Boonaroo was chartered by the Department of Shipping and Transport to carry supplies for the Australian forces engaged in the Vietnam War. As MV Boonaroo she completed one round trip voyage to Vietnam, departing on 17 May 1966 and returning on 8 July 1966. HMAS Boonaroo was a cargo vessle used to support Australian forces fighting in the Vietnam War. HMAS Boonaroo commissioned into the Royal Australian Navy at 2100 on Wednesday 1 March 1967, after members of the Seaman’s Union refused to sail the Australian National Line ship to Vietnam with a cargo of Royal Australian Air Force ordnance onboard. She was consequently taken up from trade and was the first ship of the Royal Australian Navy to commission under the new Australian White Ensign. The master of Boonaroo, Captain P Grimanes, Merchant Navy, was relieved by Commander PR Burnett RAN. Except for two engineer officers with Naval Reserve commissions, the crew was replaced by Royal Australian Navy officers and sailors. 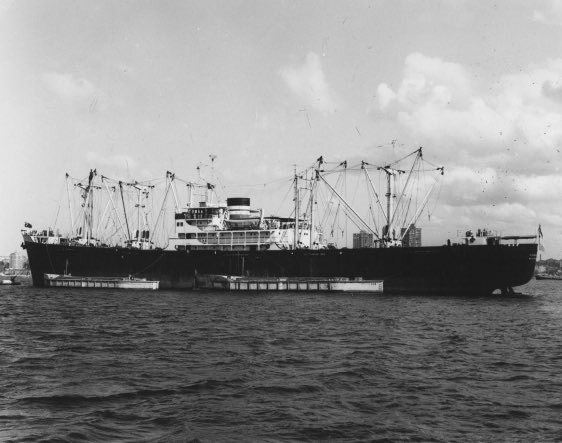 Boonaroo proceeded to Port Wilson, Victoria, on 3 March 1967 for loading of cargo. This cargo consisted mainly of palletised 1000- and 500lb bombs and tails together with a certain amount of general cargo which included three kitchen complexes, a 10-ton petrol tanker and a number of telegraph poles to be carried on the upper deck. Loading was completed at 17:00 on 10 March and the ship cast off and proceeded to sea for the passage north at 19:00. A fuelling stop was made at Cairns on 17 March. Boonaroo entered the approaches to Cam Ranh Bay at 06:15 on 28 March and anchored at 07:00 in the inner harbour. United States Army personnel from the 24th Terminal Transport Battalion unloaded general cargo into barges. On 29 March the ship shifted berth to the Ammunition Pier where ammunition was unloaded by the 154th Terminal Transport Company. Boonaroo departed Cam Ranh Bay at 07:00 on 2 April and anchored that night at Cape St Jacques, Vung Tau, receiving stores by Royal Australian Air Force helicopter the following morning. The ship then departed for the return voyage to Australia via Singapore (5-6 April) and Darwin (12-20 April), and arrived in Sydney at 1800 on 29 April. HMAS Boonaroo's forward superstructure and cargo derrick. Boonaroo’s final voyage under the White Ensign began on 3 May 1967 when the ship departed Sydney for Melbourne. 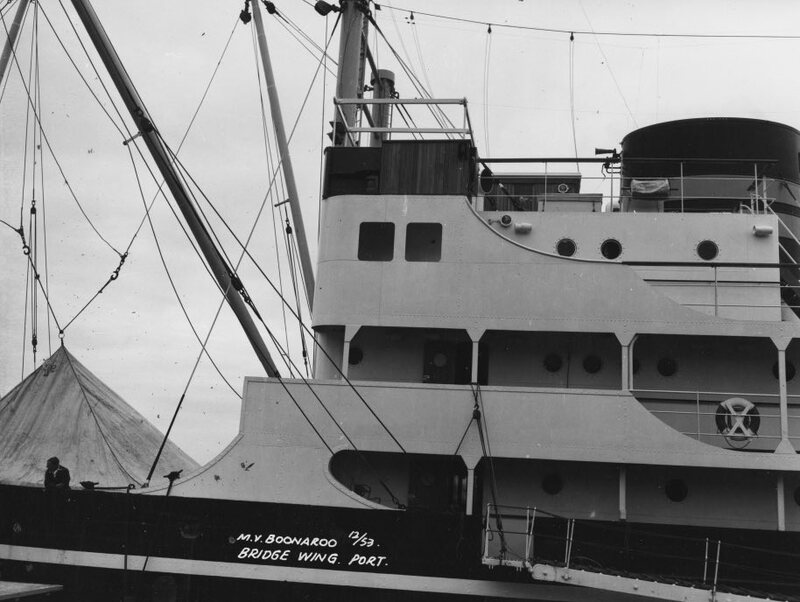 Boonaroo berthed at No 11 North wharf, Melbourne, at 20:05 on 5 May and paid off at 15:00 on the 8 May 1967, being handed back to the Australian National Line. The ship had covered 10,655 miles during her period as a commissioned unit of the Royal Australian Navy.